I'm the best freestyle motocross rider in the world, or so they tell me. All right, I'll admit it. I know I am. I'm living the dream but am haunted by the memory of a girl who destroyed me. My life's spinning out of control. I'm living a life on the edge, performing death-defying stunts high above the air, but it's beneath the helmet where I can't seem to get my head right. And then Scarlet Rose and her wild mess of blonde curls crashes into my life. She's beautiful and completely immune to anything I say or do. From the moment she denies me, my desire is obsessive, all-consuming. What is it about Scarlet I can't seem to resist? I was hired to do a job. 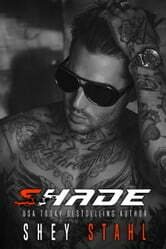 Keep Shade Sawyer and his tenacious adrenaline-driven brothers in line. Easy enough, right? Nope. Despite having no clue what a personal assistant does, I'm given the lucrative job I've been dreaming of to get me out of Seattle. Just when I think it can't get any better, I'm left with an alarming clause in the contract. "Under no circumstances can you engage in sexual relations with Shade Sawyer." Here's the problem. He's never been denied by any woman before, and now he's determined to get me in his bed. He's fiercely competitive and tests my limits. Ignoring him isn't going to be easy. Not when he's looking for a podium finish.